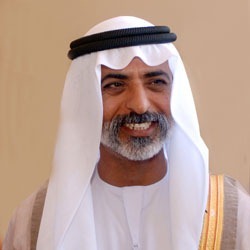 A message, coming directly from Sheikh Nahyan bin Mubarak Al Nahyan, Chairman Abu Dhabi Group, has been sent to media, which explains the situation after ongoing changes in the group at management level. Chairman Dhabi group said that Mr. Zouhair A. Khaliq will serve as Executive Director and represent the Group on the boards of Warid Telecom, Wateen and WinCom, while Mr. Naeem Zamindar will hold the position as the CEO of Wateen and Mr. Muneer Farooqui will continue as CEO at Warid Telecom. Chairman reaffirmed the commitment to all the investments, the employees and all customers in Pakistan He maintained that there are no intentions to merge or to sell Bank Alfalah at this time. “As Chairman of the Abu Dhabi Group, it is my pleasure to announce the appointment of Mr. Zouhair A. Khaliq who will serve as Executive Director and represent the Group on the boards of Warid Telecom, Wateen and WinCom, while Mr. Naeem Zamindar will hold the position as the CEO of Wateen and Mr. Muneer Farooqui will continue as CEO at Warid Telecom. Both Mr. Zouhair A. Khaliq and Mr. Naeem Zamindar are visionary and competent executives and are highly qualified. Each will continue our Group’s strong commitment to the Pakistani market and the people of Pakistan. They lead our efforts to enhance our operations and improve our organizational effectiveness. For us at the Abu Dhabi Group these new Business Leaders represent the next generation of senior executives whose focus will be on setting corporate strategies and policies, providing exceptional service to our customers and creating value for our shareholders in times of constant change. Their leadership will move our companies boldly into the future as an important part of the Pakistani economy. I take this opportunity to reaffirm our commitment to all my investments, the employees and all customers in Pakistan to make all Group companies among the finest institutions. Let me reaffirm as well that there is no intention to merge or to sell Bank Alfalah at this time. In this new year of 2011, our goal is to continue to improve our businesses in Pakistan, in order to strengthen and broaden our ability to serve our customers and compete successfully in the market place. Our Group is committed to providing the resources necessary for the highest quality of operations. By these appointments today we renew our commitment to the people of Pakistan that we will honor their trust with continued hard work and dedication. The Abu Dhabi Group and I have been doing business in Pakistan for many years and we look forward to being here for many years to come. We value greatly the excellent cooperation we have from our Pakistani brothers and sisters. We are inspired by the warmth, good will, and collaboration we receive at every level. We are proud of our accomplishments and for the reputation we have earned. We will also continue with our active participation in the important educational, cultural and social initiatives in the communities we serve. We are proud of our relationship with the people of Pakistan and are committed to being a model of responsible corporate behavior in this wonderful country. The appointment of these new businesses leaders today further express great confidence in our vision, in our strategies, and in our plans for the near future of our participation in the Pakistani economy. We are confident in our ability, God willing, to make this intended future reality. Its great to see the message of Dhabi Group chairman and his commitment towards Pakistan. I am sure all the investment group has made in Pakistan continues to enhance and it add further value to Pakistan economy and provide more growth opportunities for the talented Pakistanis. I wish great success to the group. I am sub engineer of elctricel technogy.I have 2 year working expnrice in vondur of warid(bahum assciate LHR PAKISTAN. I want to highlight and put on record for all concerned DFI’s, Banks, financial institutions heads here that Schon Group is a defaulter of National Bank of Pakistan, Allied Bank of Pakistan, Habib Bank Limited, United Bank Limited, Muslim Commercial Bank, Saudi Pak (SAPICO) and various Leasing Companies for an amount more than of Rs. 1.225 Billion. Dear Sir, It is further shocking that with a simple law degree and MBA from an unknown University Mr. Malik served and enjoyed the power of DG FCIW, NAB for six years and at present enjoying the powerful post of SEVP, NBP. His level of greediness can be well judge from an act as DG (FCIW) he also pressurized his parent department (National Bank of Pakistan) to hire his personal residence situated at Askari, Rawalpindi. National Bank of Pakistan acquired CIRC and NDFC, as an employee of SEVP, NBP Mr. Malik had excess to all documents pretending to Schon Group pending recoveries . Mr. Kausar Iqbal Malik as DG FCIW, NAB played a major role in doing an agreement in Dubai with Schon Group dated October 25, 2005. This agreement was made without taking written concern from the major creditors. He played a double game by giving a guideline to Schon Group for making Agreement with NAB and on other side protected his own interest. Being seasonal bankers, I request you all to get this Agreement evaluated. (Agreement Attached).The ability and the criminal favour done by Mr. Kausar Iqbal and losses given to NBP, MCB, HBL, ABL, UBL and Pakistani DFI ‘s can be well imagine. Sir, I do request you that Mr. Kausar Iqbal Malik’s name may kindly be put on ECL and a Consortium of all Creditors i.e. Banks, Leasing Companies should be made for taking appropriate legal action for doing an agreement with Schon Group, which purposefully delayed the processes of recoveries and put banks in a situation to take legal action and to hire eminent lawyers on heavy fees. This is an appeal for a noble cause. I request you to eliminate financial corruption and bad practices from financial institutions. Be a part of Honest Executives of Pakistan who can dare to speak against the people who are deliberately giving financial losses to Pakistan for their personal gains. Use the power delegated to you for poor tax payers of this poor Nation. Looking forward for an action which can change the History of Banking industries of Pakistan and in future no one dare to misused power delegated to work for the betterment of Pakistan and to facilitate its citizens. Injustice anywhere is a threat to justice every where. Mr. Bajwa seem to destroy the sheikhs money and company. I have wateen connection and in last forty days i made 8 times complaints for destortion and the staff has visited so many times but problem is there. Mr. Sheikh should replace Mr. Bajwa immidiatly as his team seem to be working for to destroy the business of the sheikh. Another adivice donot take adivice from Mr. Ahmad Mukhtar he has destoyed PIA. my name is stanley, i lov abu dhabi, am from nigeria, i wish u pple should help me, ezenwa . Stanley @ yahoo . Com .